I have been wanting to write a bit more on this highly unknown and commonly misunderstood infection called "Myocarditis". This is the silent monster that suddenly and unexpectedly took our daughter's life without but a whisper of a warning (a slight fever). 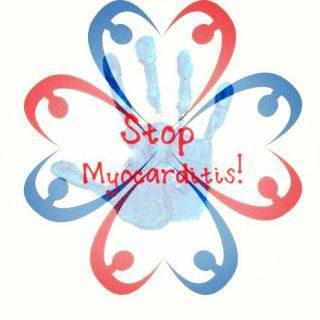 Myocarditis or inflammatory cardiomyopathy is inflammation of heart muscle (myocardium). Myocarditis is most often due to infection by common viruses, such as parvovirus B19, less commonly nonviral pathogens such as Borrelia burgdorferi (Lyme disease) or Trypanosoma cruzi, or as a hypersensitivity response to drugs. The definition of myocarditis varies, but the central feature is an infection of the heart, with an inflammatory infiltrate, and damage to the heart muscle, withoutthe blockage of coronary arteries that define a heart attack (myocardial infarction) or other common noninfectious causes. Myocarditis may or may not include death (necrosis) of heart tissue. It may include dilated cardiomyopathy. Myocarditis is often an autoimmune reaction. Streptococcal M protein and coxsackievirus B have regions (epitopes) that are immunologically similar to cardiacmyosin. During and after the viral infection, the immune system may attack cardiac myosin. Because a definitive diagnosis requires a heart biopsy, which doctors are reluctant to do because they are invasive, statistics on the incidence of myocarditis vary widely. The consequences of myocarditis thus also vary widely. It can cause a mild disease without any symptoms that resolves itself, or it may cause chest pain,heart failure, or sudden death. An acute myocardial infarction-like syndrome with normal coronary arteries has a good prognosis. Heart failure, even with dilated left ventricle, may have a good prognosis. Ventricular arrhythmias and high-degree heart block have a poor prognosis. Loss of right ventricular function is a strong predictor of death. We just received a copy of the medical examiner's report on Vienne's case and autopsy. I had requested it only because I wanted written confirmation of this myocarditis thing. All we had known was what Mark had interpreted from a conversation with them over the phone, many months ago. I wanted to make sure that he heard everything correctly. What I DID NOT want was a play by play of the events of that day. But, naive-little-me, not thinking clearly...that is exactly what we got. And, like a moth drawn to a flame, I couldn't help but read it and keep reading it, page after gruesome page. IT. WAS. HORRIBLE. Why did I do this to myself???!!! It was seriously one of the most STUPID things I have ever done...and yet, I couldn't stop. As if I enjoy punishing myself further. There were new things in the report that I didn't even know about...or remember. Little details that the investigators and examiner look for and pick up on. Things like: my spilt smoothie all over the bathroom floor...of which I have NO recollection of. The fact that they noted that my arms were free from scratches...as they were looking for the possibility that I had drowned her (read the tab at the top of the page to get the whole story of that day if you don't know it already). The fact that they noted how well-kept Ivy was - clean and healthy and nicely dressed. They noted Vienne's clean finger and toenails - neatly trimmed and painted with pale green nail polish. ...That's enough. Anyway, the point of bringing that up is because on the cause of death they wrote "ACCIDENT". That's it. Then, next to it they have a space that says: "Significant Indicators/Factors: Right Ventricle EPI/Myocarditis" (from what I've looked up, EPI = episode). If you thoroughly read the definition above, the last sentence says "loss of right ventricular function is a strong predictor of death". A few sentences before that it says "Heart failure, even with dilated left ventricle, may have a good prognosis." Vienne's right ventricle was inflamed ("inflamed" was the word they used to describe it to Mark over the phone). First, it of course pisses me off that the damn infection went to her right ventricle...the side that would more likely cause death. And, secondly, it pisses me off that they still write "Accident" even after that documented fact about her Right ventricular myocarditis! The ONLY reason they admitted to us for documenting it as an "Accident" is because she was found in the tub...EVEN though they revealed to us that she showed absolutely NO signs of drowning or struggling. They cannot prove that it was just the myo that took her life. I have shared this all before. I try to ignore that word...Accident. For "accident" says it's my fault. I try. I try. I try to ignore it. What I want to adamantly clarify in this post is that Vienne did NOT have a faulty heart that was just waiting to go into distress. People around us still don't seem to understand this thing as we have just never heard of it before. Myocarditis is an infection in the heart. It is typically caused by viruses or bacteria or even some parasites. But, most commonly it is caused by a virus (and not just one specific virus...there is a whole list of viruses that can take infection to the heart!). The person catches a virus, like we ALL do especially in the winter months (ie: flu virus) and for no known reason, no predisposition, the virus can head straight to the heart and bring infection to it. Just like a flu or cold can happen to anyone, so can this. The influenza virus can even cause this...can take the infection to the heart. Why? There is not a known reason. But, once the heart is attacked, this monster of an infection works QUICKLY. Lightning speed quick. Obviously, because we had NO CLUE. Symptoms in infants and toddlers tend to be more nonspecific, with generalized malaise, poor appetite, abdominal pain, and/or chronic cough. Later stages of the illness will present with respiratory symptoms with increased work of breathing, and is often mistaken for asthma. Since myocarditis is often due to a viral illness, many patients give a history of symptoms consistent with a recent viral infection, including fever, rash, diarrhea, joint pains, and easy fatigueability. I have just learned of a local little girl, in Troutdale, OR, who is in the hospital right now fighting for her life because of myocarditis. A friend of mine directed me to her FB page and I have been following the daily updates on her progress. It is seeming that she is of the lucky ones who is given a chance to fight this...and it looks like she *might be* slowly winning. Her name is Elliott. Elliott's story is that she presented symptoms of vomiting...from what I gather, they were coming home from family trip. She vomited for 3 days and they took her to the hospital on May 11, just a few weeks ago. The doctors didn't know what was wrong with her, but one thing led to another and she stopped breathing and her heart stopped. They worked on resuscitating her for 4 hours...keeping her alive. They performed an echocardiogram and discovered the myocarditis...in her left ventricle. Shortly thereafter, they determined that it was caused by the influenza virus. From the snippets of things I've read, I have gathered that Elliott's heart, lungs, kidneys, and brain have all been severely affected. She has been on ECMO (which I gather is life support?) this whole time. Just the other day, they successfully took her off of it and her heart is performing at a normal rate! They are now waiting for kidney improvement and brain function amongst several other things. Her battle is definitely not over. Scary crazy isn't it? Please pray for this sweet family. They are a family of believers and they have a battalion of prayer warriors standing by their side...and could always use more. Of course I am jealous. How could I not be! I look at their story and think that they are going through this horror, yet also getting to watch God perform miracles and they will get to use this story as ministry to God's works for the rest of their lives. God will use their story just as profoundly as He will use Vienne's...but they get to keep their child! So, why didn't I?? I try and I try to find a reason and I don't know if I will ever ever come to settle on one...there will never be a reason to satisfy. I realize that I may just have to swallow and just live with it. It is a difficult thing to reconcile. In addition to becoming aware of the possibility of this silent unknown killer how can you stay alert to it, for yourself and especially for your children? Well, obviously, from what I've shared and what I've experienced, unfortunately there is not much. What I do NOT want is to create paranoia and panic for you for whenever your child develops a slight fever. We could develop panic and paranoia for every time we get in our cars due to the high statistics of accidents...but we generally don't. What I would say or encourage you to do is to just try to remain extra aware of your children when they are sick. And, by that I mean ask specific questions. Sometimes, I wonder if I had asked Vienne if anything hurt, whether she would have pointed to her chest or something? She did tell me that her tummy hurt...but, maybe it was also her chest? So, maybe when they are sick ask them a string of simple questions, with the aim to evaluate their overall discomfort. And, if you have further suspicions take them to their doctor and perhaps even ask about the possibility of myocarditis and request a troponin test. Thank you, Diane. Your encouragement means a lot. :( No, it's not fair. Thank you friend, for your continued compassion. Thank you for providing some more information on this horrible thing. To help me from going crazy due to constant worrying, I'm just giving it to God. It's still easier said than done but I'm working on it. I'm actually following Elliot's story on Facebook and you were literally the first person I thought of. I had wished Vienne had more of chance like sweet Elliot. If I had known about this petition you mentioned, I would have supported it 100%. It really is sad more people didn't. The world needs more awareness. You are continually in my prayers. Sending big hugs and kisses for Ivy! I am glad this post was helpful in bringing some awareness. I could've gone on and on about it, for sure. Signs, symptoms, diagnosis, survival...etc. It is wise to just give it to God. This is one that you cannot let dictate your parenting...but it is still good to be aware of. My wish is more that Doctors would grow aware of this one. Thank you for being willing to sign the petition. If another one is written, I promise to post it one here. I would be happy to post the link to the petition on my facebook as well, it is worth a shot, right? Will I be able to find it from the links posted above? We lost my sister suddenly, almost 12 years ago now, to a brain aneurysm. Recently, my cousins step mother suffered a brain aneurysm and recovered. I thought all the same things you wrote about. Of course, it isn't that I didn't WANT the step mother to recover, it just makes me think, why could things not have been different for my sister? If she had been awake when it happened (she was sleeping, it happened just about the time she was supposed to wake up), would things have been different? I continue to pray for your sweet family. I would be happy to help promote any awareness. Thank you so much, Emily. Unfortunately, the petition has not expired and is no longer viewable. Not even nearly enough people signed it. I am sure another one will be created eventually and I promise to post it on here. I am so sorry for the sudden tragic loss of your sister. Thank you for sharing and thank you for sharing about your struggle in envying the survival of your step mother. I completely relate. Your prayers mean so much. Thank you. Hi Jenny. Elliot's dad is our financial planner. I've been following her updates and praying but didn't realize the root issue was the same as Vienne's. And I'm sorry the report was so awful to read. We continue to pray regularly for you and Mark, and your mom and Tom. Sending love your way! Wow, small world, Jodi. They seem like a pretty solid and great family. I am on the edge of my seat every time I read their updates.